YouTube is the biggest video sharing website on the world. Many people want to convert YouTube to DVD for a better video experience on big screen TV, or to share videos with friends, or to backup movies for a long time, etc. To burn YouTube video to DVD, you can use Aimersoft DVD Maker, an easy-to-use yet powerful DVD burning software which lets you burn YouTube videos to DVD easily. Besides, various delicate DVD menu styles allow you to create the most personalized YouTube video DVDs. The Mac YouTube burner - Aimersoft Mac DVD burning software also receives popularity among users who want to convert downloaded YouTube video files to DVD on Mac (Mountain Lion). Download and install the DVD converter and follow the steps below to burn YouTube videos and movies. Make sure your get the right version according to your computer's operating system. Click "Import" to add the YouTube videos into the program. They will appear in the Source pane. If necessary, touch up YouTube videos using tools like crop, trim, add watermark, adjust video effect, etc. Select desired YouTube video and click Preview button to watch the editing result. Or go to Preview tab to watch entire YouTube video DVD in case that you may improve it in a certain way. When everything is OK, go to Burn tab to make settings and start converting YouTube videos to DVD. Here is the video tutorial on burning DVDs from YouTube videos. The default resolution of YouTube video is 320x240 while DVD video size is 720x480 for NTSC or 720x576 for PAL. Therefore, the DVD video quality may not be as expected. You are recommended to set video quality to "High video quality" in Burn tab (the option in the bottom right corner). Burn JVC Everio to DVD: How to burn JVC Everio videos to DVD? Find the best solution here. Olympus Tough to DVD: Having encountered problems when converting Olympus Tough videos to DVD? Fix them now. Sony Cyber-shot to DVD: Wondering how to burn Sony Cyber-shot videos to a DVD disc? This article will tell you the answer. Home Videos to DVD: Want to burn home videos to DVD for long-time preservation? Follow the tutorial to accomplish the task. Canon Video to DVD: The articles describes the simple steps for burning videos recorded with Canon to DVD. Panasonic Video to DVD: Have some Panasonic videos and want to burn them to DVD? Start your task now. Samsung Videos to DVD: How to burn Samsung videos to DVD easily and quickly？ Get the answer here. Convert 8mm to DVD: If you'd like to convert 8mm tapes to DVD, you can follow this article to accomplish your task with ease. Transfer Camcorder Video to Computer: Have problems on transferring camcorder videos to DVD? Solve the problems right now. JVC Video to DVD: The article will guide you to burn multiple JVC video files to a DVD disc step by step. Hi. Our program is 100% safe and clean. You can download the latest version without worrying the virus. After you have successfully downloaded and installed the program, you are able to burn YouTube videos to DVD with ease. I'm looking for software to burn youtube and other online videos to DVD so I can share with parents (who are computer-less). I don't want to be attacked by adware junk and other pop-ups, etc. Am I able to do that with your program? What is the best version? Hi, there will be watermark on the output video, and this trial version will expire in 30 days. I am wondering what is the limitation of the trial version. Its multiple functions allow me to create the most personalized YouTube video DVDs. I use it to burn YouTube videos to DVD with ease. It is really powerful DVD burning software. Hi, Aleksansra. 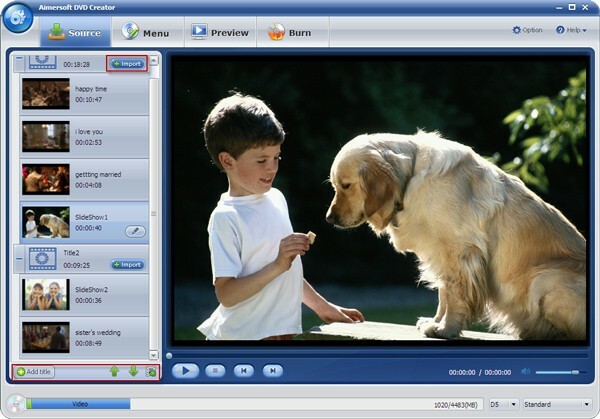 Aimersoft DVD Creator can only burn videos and photos to DVD. If you want to download videos from YouTube and then burn them to DVD, please turn to Aimersoft Video Converter Ultimate. Hi, will this software download videos from YouTube? I have downloaded some videos from YouTube and have burned them to DVD following this guide. Now i can watch the sweet video on TV with my family members now. So happy!